The Elbe-Havel Canal makes it possible: starting in the Ruhr industrial area, you can get all the way to Poland without leaving the water. What&apos;s more, the canal offers cruise enthusiasts views of a fascinating part of Germany. The 56 km-long Elbe-Havel Canal flows through the states of Saxony-Anhalt and Brandenburg. It connects the Midland Canal at Magdeburg with the "Großer Wendsee" at Brandenburg on the Havel. The best time for an Elbe-Havel Canal Cruise is between May and September. 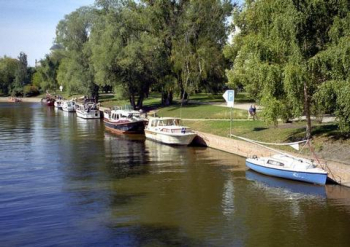 As a rule, an Elbe-Havel Canal Cruise will take in a trip on the Elbe. A trip on the Elbe-Havel Canal itself will take you to some delightful little towns with treasures that are well worth seeing. These include Genthin with its octagonal water tower, the village of Wusterwitz with the lock of the same name, the fortress towers of Burg and Brandenburg on the Havel, home to Brandenburg Cathedral. Go on a cruise on the Elbe-Havel Canal and experience the flair of eastern Germany&apos;s landscapes and culture in their most pristine form.